Welcome to the portfolio website of Glenn Korver. I am a Gameplay Programmer currently living in Breda and following the IGAD (International Game Architecture & Design) program at NHTV University. 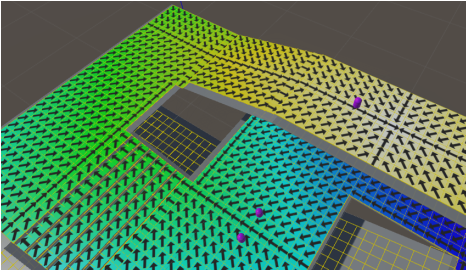 A pathfinding tool for Unity that is compatible with overlapping terrain. Users can change the world by adjusting cost values and placing obstacles, both in the editor and at run-time. 4 player multiplayer game made in Unity. School project made with a team in 14 days and winner of the "Best Game" award for that year. Pathfinding research project about A*, Jump Point Search and Flow Fields. The project's thesis is meant to be usable for other game developers as a starting point for choosing the right method for your project.